Indian public listed companies donated a record amount in 2014-15, the year in which the last general elections took place. However, a year thereafter corporate benevolence seems to have dissipated. Total corporate donations declined more than a fifth to Rs 1,651 crore during 2015-16, after spiking almost 24% the year before, VCCircle research based on disclosures by public listed firms show. "We are against any donations by corporates. We have consistently voted against political and even charitable donations by them,” says Shriram Subramanian, founder of proxy advisory firm, InGovern. Corporate donations are made both for philanthropy as well as for political support. Some companies specifically disclose political donations. For instance, Bharti Airtel, which had shelled out Rs 142.2 crore the previous year, saw its donations shrink to Rs 139 crore for the year ended 31 March 2016. The telecom firm’s consolidated account reveals that it had political donations worth Rs 31 crore in FY15 as against none last year. It had made political donations to Satya Electoral Trust, whose top beneficiary was Bharatiya Janata Party (BJP) that emerged victorious in the general elections in May 2014. Satya Electroral Trust had also backed Indian National Congress. But many firms do not provide for separate disclosures and it is alleged that a part of other corporate donations, too, finds its way for a political or non-social cause, routed through little known organisations. InGovern’s Subramanian says even though corporate social responsibility (CSR) spends is mandatory for corporates, it is the shareholders who need to decide how to donate rather than company deciding for the shareholders. Many large firms donate a large chunk of the corpus to their own foundations. Reliance Industries Ltd, which remained the top firm in terms of corporate donations, gave Rs 603 crore out of total Rs 684 crore to its related party entities: Reliance Foundation (Rs 584 crore), Hirachand Govardhandas Ambani Public Charitable Trust Others (Rs 4 crore) Jamnaben Hirachand Ambani Foundation (Rs 15 crore). Reliance Industries’ overall charity and donations declined by 15% last year. 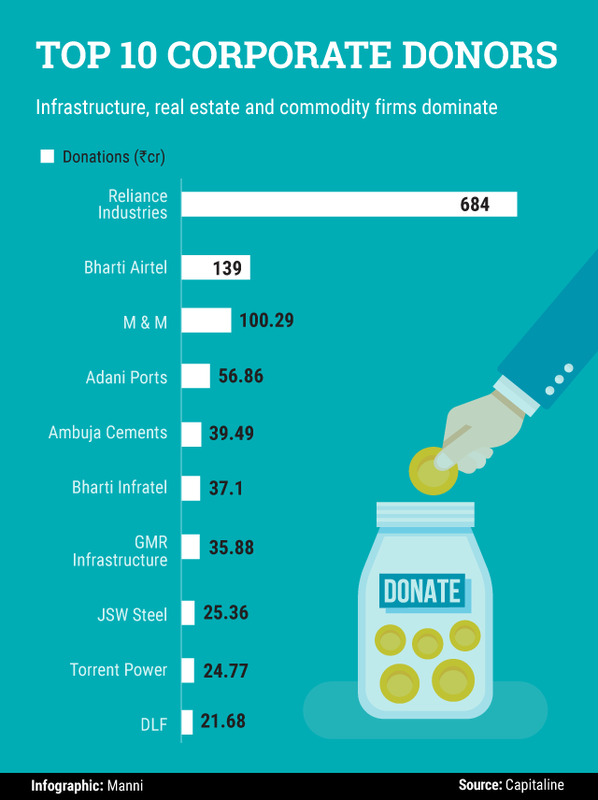 M&M, Adani Ports, Ambuja Cements, GMR Infrastructure, Bharti Infratel, JSW Steel, Torrent Power and DLF were among other notable corporate donors last year. Realty firm DLF was among those recording a decline in donations compared to the previous year when the elections took place. DLF’s donations had almost doubled to Rs 64.85 crore in FY15 before seeing this decline by two-thirds last financial year. Jindal Steel, Adani Enterprises, Grasim and UltraTech that figured among the top donors in FY15, fell out of the charts last year. Interestingly, the entry and exits to the top charts has some interesting shades. So, Naveen Jindal run Jindal Steel dropped off, his elder brother’s JSW entered the charts. Naveen, once the promoter of the most valued public listed steel firms in India, himself is a past parliamentarian representing the Congress party. Adanis, considered close to BJP and in particular to Prime Minister Narendra Modi, saw one firm move out while another stayed on in the chart. In the cement sector, Holcim (now LafargeHolcim) controlled Ambuja Cements entered while AV Birla Group’s UltraTech and its parent Grasim, fell out.